Guacamole is one of my favorite things in the entire world. 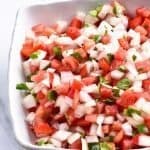 I love it as a dip, atop grilled chicken, along with any number of recipes, or even as a topping on a simple salad. I love to go to restaurants where they make it fresh right at your tableside. The entire area is immediately perfumed with the scent of all the fresh ingredients and you know exactly what is going into your guacamole! 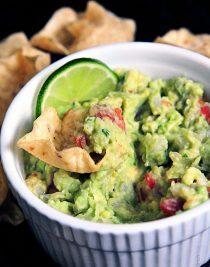 In just a few minutes, your served a bowl of fresh, bright and delicious guacamole along with crispy chips or other items to dip into your guacamole. But you know, guacamole is just as fast and easy to make at home. 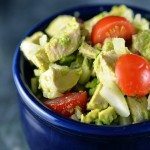 You only need a few simple ingredients and in less than five minutes, you’ve created one of the best guacamole recipes I’ve ever tasted. And you didn’t even have to change out of your yoga pants. We all know that the big game will be upon us soon. 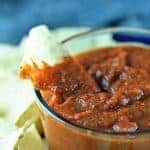 With that comes the absolute need for great game day recipes you can make and share with family and friends as you watch the game. Do me a favor and go ahead and add this guacamole to the list. With this simple recipe, you can then add so many other variations. Grilled corn makes a great touch as does grilled jalapenos or Serano chilis. The addition of the fire-roasted ingredients adds a whole new level to the flavor of this guacamole. 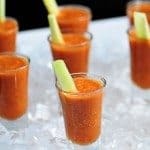 You can also add a touch of fresh orange juice for a remarkable flavor. 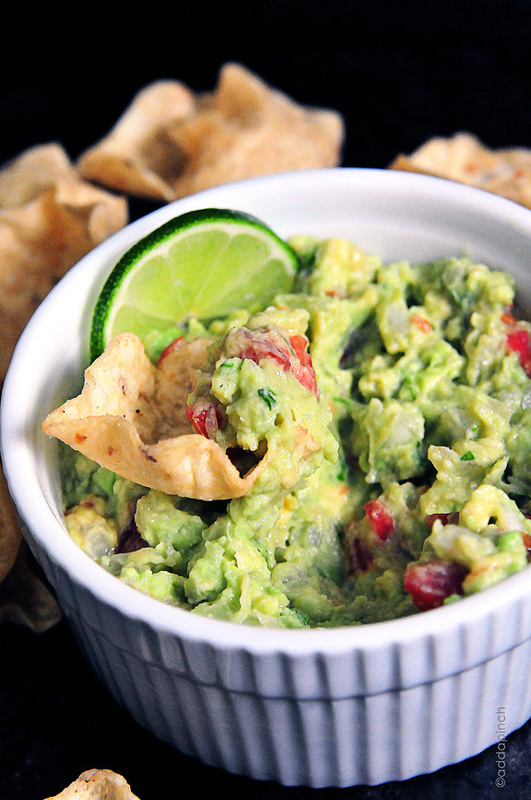 Guacamole makes a fresh, delicious dip as well as addition to so many dishes. 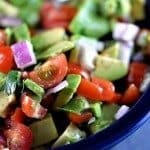 This guacamole recipe is ready in less than 5 minutes! Mash avocado with a fork or potato masher in a bowl until the consistency you prefer. Add lime juice and salt and mix well with fork. Stir in tomatoes, onion, and chopped cilantro. If using cumin, add at this point. Pour into a serving bowl and serve. To help keep guacamole fresh, return pit of the avocado to the prepared guacamole, cover with plastic wrap, making sure to press the plastic wrap onto the guacamole to keep as much air as possible away from the guacamole. Refrigerate until ready to serve. Oh yes, it is a staple for me. So, so good. Robyn, sounds like you and I share a deep LOVE of guacamole!! When I began making my own from scratch, it was life changing. 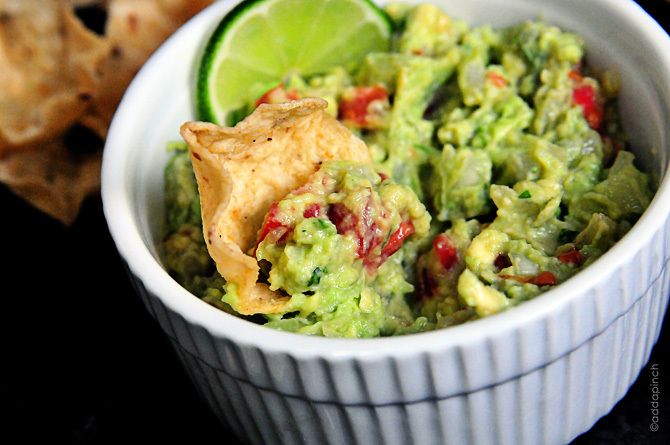 😉 There is nothing like fresh homemade guacamole…. though I’ve never tried adding cilantro or cumin and anxious to do so! Mmmm guacamole! You make yours the way I make mine…with tomatoes and onion! YUM! Isn’t it awesome and so simple to make! 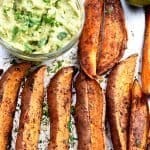 Oh my, I need to try it with fajita seasoning. That sounds pretty amazing! Me, too! Just right by itself is good with me, too. Definitely a recipe everyone needs! Yum! That guacamole looks so tasty! Very much how I make mine – such a great recipe! I am going to make this for the Superbowl! Thank you! It looks so delicious. Copied recipe as I have about 6 in frig… Hopefully not overripe.. found a bargin price at ALDI at .25 cents a piece.. Couldn’t pass them up at that price… Enjoyed then plain with a squeeze of lemon or lime juice but your recipe sounds delish!!! I made Guacamole for the first time last month, i surfed the net and your recipe was the easiest to work with. I didn’t include the cumin in mine recipe. Everyone loved it, so i’ll be making it again soon. I’m going to try the “strawberry Cake” recipe. I like that you recipes are simple and easy to follow. Most of the items on the ingredient list are things that most Ppl have at home already. Thanks for keeping the recipes fun & simple. This is the exact recipe I have used for years. One addition though, red pepper flakes. It gives it a little kick!